North Vancouver, B.C., Canada, claims to have made a significant breakthrough in nozzle design more than 50 years after the development of the original Kort nozzle in Ger- many. The outline of the Kort nozzle has become familiar to operators of tow- boats, fishboats, supply vessels and other workboats over the years. The inside of the Kort nozzle is shaped like a venturi tube, flared entry, cylindrical section usually made of stainless steel at the propeller plane and a cylindrical or cone section on the nozzle exit. Its leading and trail- ing edges are made from the pipe or the solid round. The exterior of the nozzle is always a cone. NautiCan Enterprises Ltd., decided that if one could design a nozzle with an airfoil shape that had ex- tremely low drag, then it would be possible to increase the efficiency of any vessel. The new NautiCan nozzle has a continuous curvature of its inside and outside surfaces, similar to the wing section of an advanced air- craft. Unlike the conventional noz- zle which is circular, the new nozzle is actually a 36-sided polygon. The Westrac, operated by Western Tow- boat, is fitted with NautiCan nozzles. by adapting the advanced theory of the wing section to the original noz- zle design, the newly developed noz- zle not only improves thrust at low- er speeds but also increases the free- running speed of a vessel. NautiCan nozzle was achieved with the use of a more efficient airfoil section. Model tests performed at the Vienna Ship Model Basin showed that the NautiCan nozzle has 17 times less drag than an industrial standard 19A type nozzle. There was no flow separation ob- served on either the inside surface or outside surface of the NautiCan nozzle. The model test also showed a 12 percent better efficiency over the open propeller at higher speeds. NautiCan Enterprises reports that in actual sea trials, speed in- creases of 0.4-1.0 knots were at- tained. In the instance where a Nau- tiCan nozzle was used to replace an existing Kort nozzle, the measured bollard pull increased from 20,000 pounds to 23,000 pounds. Free run- ning speed of the vessel was in- creased by three-quarters of a knot. With the use of an advanced pro- peller design in place of the conven- tional Kaplan propeller, there was a significant reduction in vibration and noise. The NautiCan nozzle is fabri- cated out of a number of small seg- ments, each of which resembles a section of an aircraft wing. The inside surface of the nozzle is made entirely of stainless steel. Maritime Ltd., NautiCan Enter- prises developed a one-piece, hol- low-cast nozzle using stainless steel or high tensile bronze. GSI Explorer, operated by Geophy- sical Services Ltd., is fitted with three of the nozzles. Northwest Section's spring meeting last year, the full potential of the nozzles will be realized only when they are applied to vessels operating at higher speeds. Improved flow over the nozzle section opens possi- bilities for quieter running propel- lers for military applications and seismic research vessels and passen- ger vessels. Windstar Sail Cruises, Westours, and Westmark Hotels. Mr. Arison indicated that the two companies would remain sepa- rate entities, and that there would be no changes in the HAL's opera- tions or management. Vulkan AG, Bremen, West Germa- ny, had expired because financing for the vessels had not been ar- ranged within the agreed time peri- od. Tenders have been called for from a number of shipyards in Europe and Japan for five containerships, costing $48 million apiece, to carry 3,000 twenty-foot containers (TEUs) each. 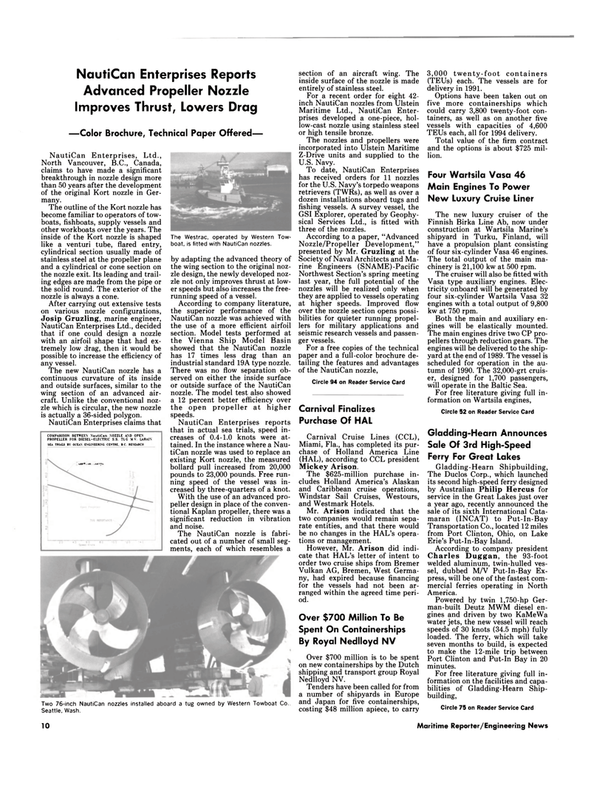 The vessels are for delivery in 1991. TEUs each, all for 1994 delivery. Total value of the firm contract and the options is about $725 mil- lion. Finnish Birka Line Ab, now under construction at Wartsila Marine's shipyard in Turku, Finland, will have a propulsion plant consisting of four six-cylinder Vasa 46 engines. The total output of the main ma- chinery is 21,100 kw at 500 rpm. Vasa type auxiliary engines. Elec- tricity onboard will be generated by four six-cylinder Wartsila Vasa 32 engines with a total output of 9,800 kw at 750 rpm. Both the main and auxiliary en- gines will be elastically mounted. The main engines drive two CP pro- pellers through reduction gears. The engines will be delivered to the ship- yard at the end of 1989. The vessel is scheduled for operation in the au- tumn of 1990. The 32,000-grt cruis- er, designed for 1,700 passengers, will operate in the Baltic Sea. Port Clinton and Put-In Bay in 20 minutes. Two 76-inch NautiCan nozzles installed aboard a tug owned by Western Towboat Co.